by Gary L. McIntosh. Baker Books, 2002. 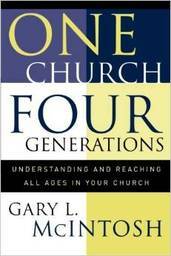 If you want to read a book that does more than simply acknowledge the issues related to generation gaps and would like to understand how to bridge those gaps, One Church, Four Generations is a good place to turn. Gary McIntosh, professor at Talbot Seminary and founder of McIntosh Church Growth Network, describes four generations that comprise today’s churches (Builders, Boomers, Busters and Bridgers) and why they have the values, interests and qualities they have. It insightfully explains how history has shaped each generation and what can be done to reach across generations and speak the other’s language. Containing useful descriptions, graphs and diagrams, this book will help clergy and laity of any faith community better understand how to create intergenerational ministry and overcome the generational gaps in their church.